As a floor manager in the hospitality industry, Joy always looked at ways to improve the customer service standards in her workplace. Passionate about delivering great service Joy felt that a degree would enhance her knowledge and understanding of customer experience. “I always endeavoured to treat customers and colleagues at work exactly how I like to be treated,” Joy explains, “I felt a degree would be a perfect opportunity to hone my skills”. During her time at London South Bank University (LSBU) Joy was lucky enough to work in Philadelphia for 12 months. Working in Philadelphia broadened Joy’s professional experience. It gave her a valuable insight into the international dimension of customer service as well as the opportunity to reflect on the commonalities and differences to the UK-based hospitality role she’d held prior to studying. Joy’s talent for - and commitment to - customer service was quickly recognised by her placement employers and led to a number of service awards. In Philadelphia she picked up a nomination and award for the Associate of the Month, and received a nomination for Service Excellence Award, whilst working at the Embassy Suites, part of the Hilton Hotel and Remington Brand. 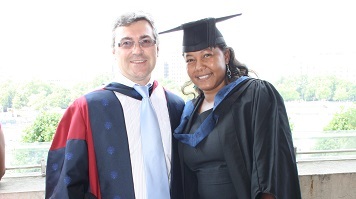 Joy was also a course representative during her time at LSBU. This gave her the perfect opportunity to shape the service she and her peers received. This meant she spoke with students about their needs, concerns, and effectively communicated these considerations to key academic staff who she’d built a strong relationship with. But it wasn’t until close to graduation that Joy discovered she’d been nominated for academic excellence and also awarded the Course Directors Prize, both of which demonstrate her dedication to the course during her time at LSBU. Joy suffers from epilepsy and found that it worsened during her studies but this didn’t stop her from pursuing her interests in something really rewarding and positive. Joy recalls how academic staff members provided a solid foundation through her time at LSBU: “I have epilepsy and during one year it particularly affected my studies, but all of the academic team were so understanding. I especially recall how supportive Dr Duncan Tyler was, but actually, every teaching member of staff at LSBU really left me with positive memories”.